This artwork was created by artist Lew Wagy (1884-1968). The limestone figure stands at 40" high. Hidden almost from sight southeast of the Gatehouse is this unpretentious little stone shepherdess and her dog, which Allerton had Lew Wagy, a Monticello gravestone carver, adapt from an eight-inch-high German porcelain figurine in the house. The figure is conceived two-dimensionally, much as a tombstone relief might be, and for the spectator standing off to the side, the broad-visaged lady and her alert dog very nearly evaporate into space. 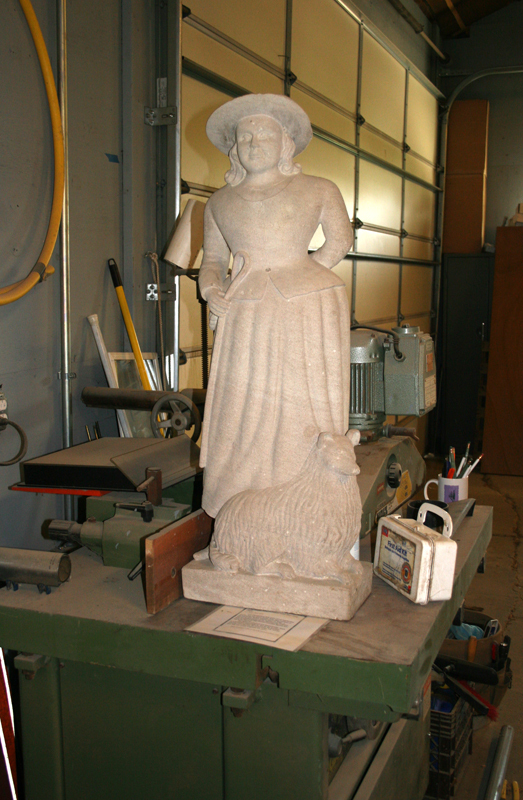 The Little Shepherdess and her Dog are currently in the Conservation Barn but are normally southeast of the Gatehouse. Muriel Scheinman, “The Little Shepherdess and Her Dog, 1940,” ExploreCU, accessed April 19, 2019, https://explorecu.org/items/show/52.